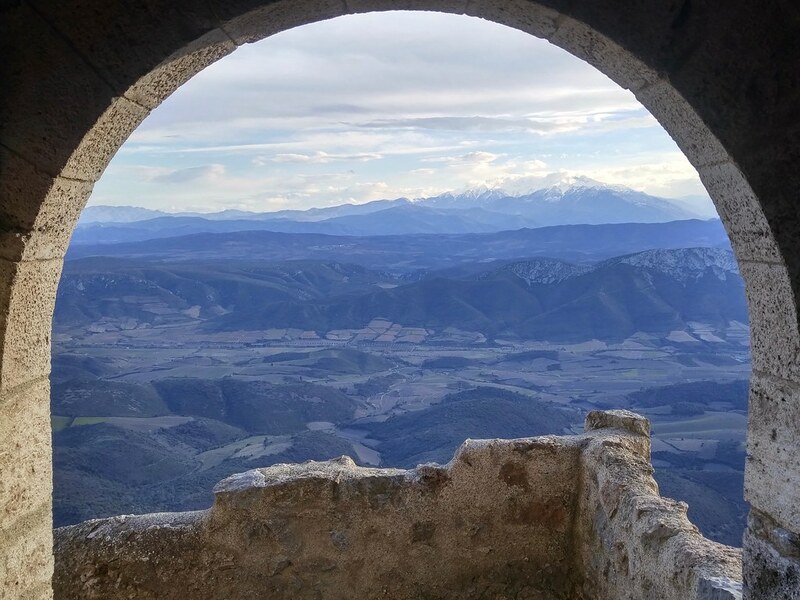 On March 25, I and my family loaded up our little car for an overnight trip to Quillan in the Aude (11) Départment. Much of the drive retraced our route to Bessède-de-Sault in February. This time, however, we actually pulled off the highway near Maury and drove to the Mas Amiel vineyards and winery. Mas Amiel is well known for its sweet wines and also makes a bunch of table wines that I've enjoyed. Vineyard crossroad near Mas Amiel. Note the bump on the left horizon. Sadly, we found the winery exceptionally closed when we arrived. We weren't entirely disappointed because the grounds were interesting and we were well received by the vineyard's free-ranging mascot, a friendly Australian Cattle Dog. 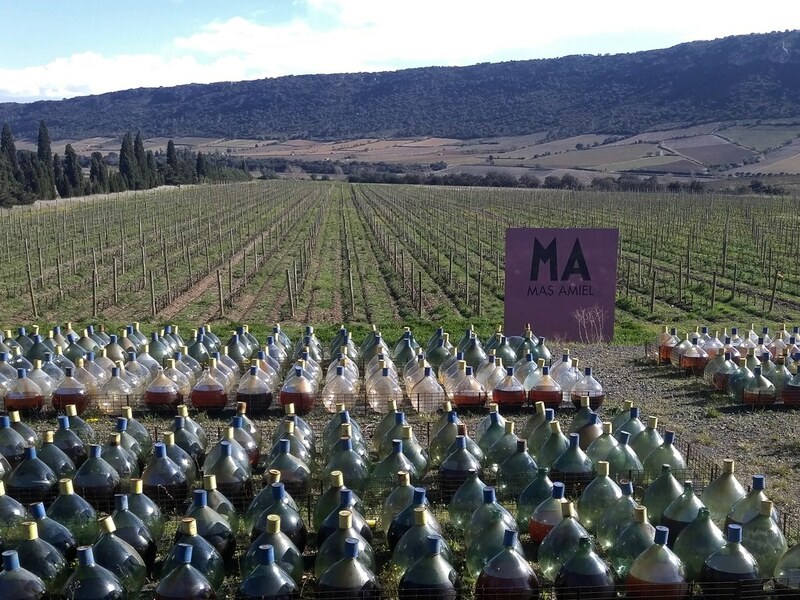 Sweet wines oxidyzing in the Languedoc sun for up to a year in these demijohns before they go into a bottle. After being subjected to the treatment depicted above these sweet wines are practically immortal, remaining delicious for 40 years or more. After leaving Mas Amiel, we made a trip to that bump on the ridge above it that I mentioned above: the Château de Quéribus. The parking lot and the entrance to the site are only about 25 minutes from Mas Amiel. 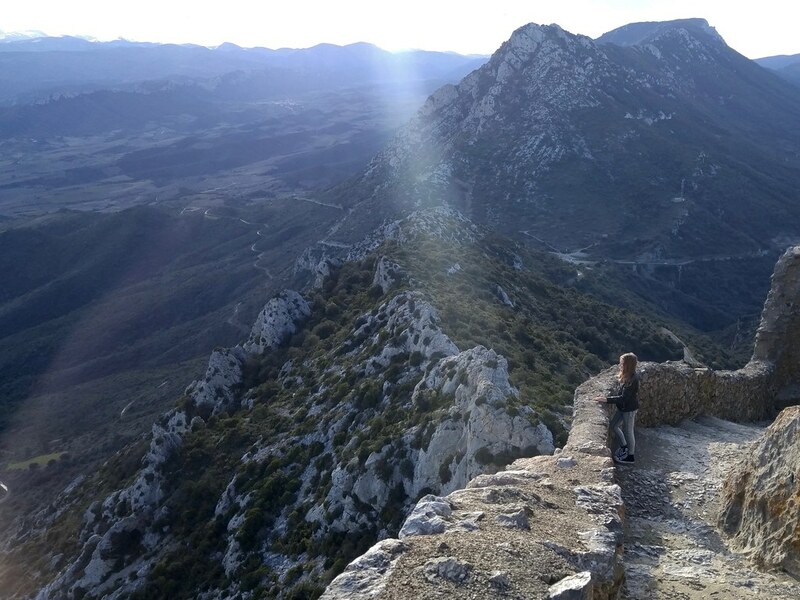 We arrived just before closing; the sole staffer left as we hiked in and we were alone in this 1000 year-old Cathar fortress. Below the keep, looking south. My family and I have been reading and listening to a lot of high fantasy stories on this trip to France and we love trips to these old castles. It's easy to imagine the gold and red flags and the cross of Toulouse up here and the banners of France below. The limestone cliffs remind me so much of Logan Canyon, where I hiked and camped when I was the same age as my kids, it's quite uncanny. Canigou, the easternmost major peak of the Pyrénées. Before dark we headed down from the ruined castle and paused in Maury to visit the local wine cooperative. We found a fairly raging party in the tasting room. 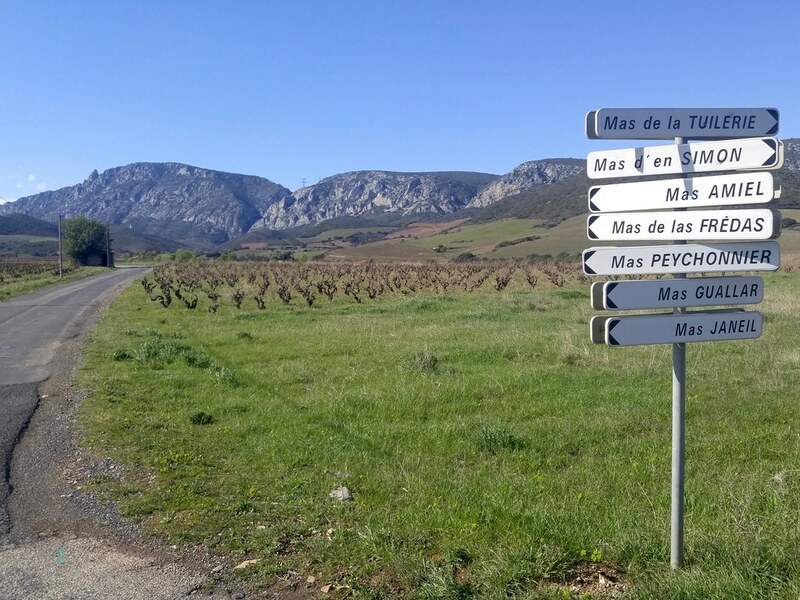 Ruth and I picked up a carton of Maury schist-based syrahs and some sweet wines and then we continued up the road to the Gorges de la Pierre-Lys and Quillan. The next morning I would be heading to the starting line of the Trail de Quillan.